Edited to add link to PDF (below) of consultation display board images & comment form (Word Doc). It appears WordPress doesn’t allow images in comments so… A new post. The obvious one that can benefit from being built at the same time as this development is the Toucan link to the North entrance of the Two Tunnels path. Frank/Nigel R. – do you know if there’s money already earmarked for this by BANES? 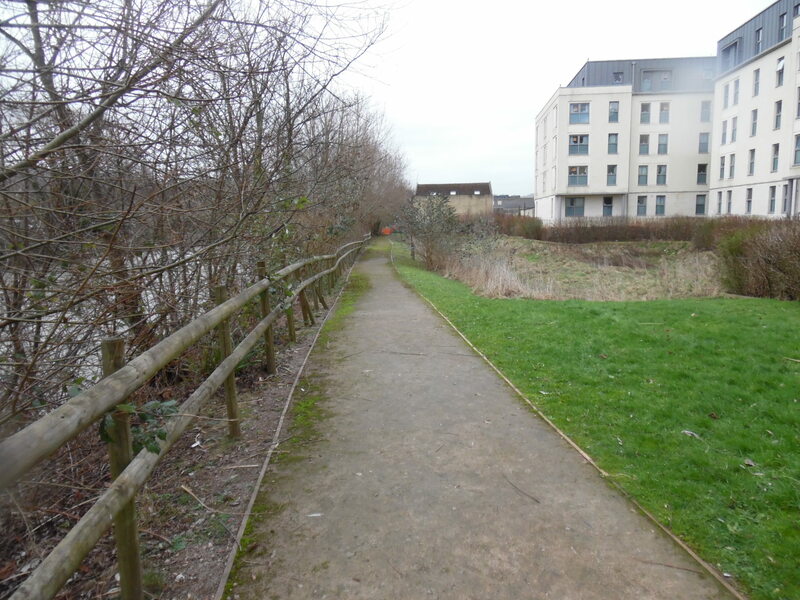 Another link is to the West, next to the Church building which can join up with the existing path between the student accommodation & the river, See image. This is looking East, the church building is in the background. Further West a bit of shrubbery needs to be removed & it can then join into the Lidl car park. I can’t say for sure but I would be extremely surprised if the toucan crossing from TT is already in the B&NES budget. I would think officers would hold off until there was some knowledge of what was proposed for the RP site.